Van Wert’s Kristen Clay, top, and Austin Clay compete in the discus and shot put respectively during Friday night’s Ehresman Memorial Track and Field Invitational. 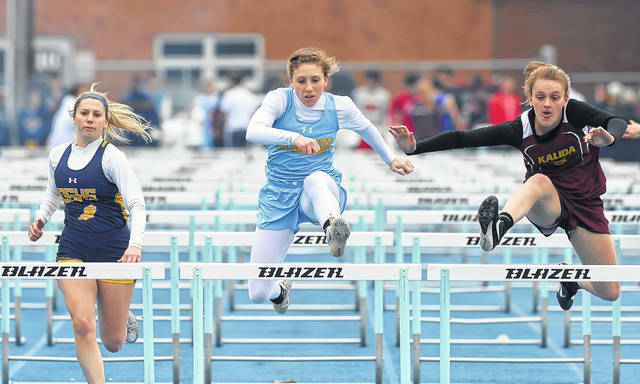 Ottawa-Glandorf’s Caitlin Bockrath, left, Bath’s Caitlyn Renner, center, and Kalida’s Brenna Smith compete in the 100 meter hurdles during Friday night’s Ehresman Memorial Track and Field Invitational. 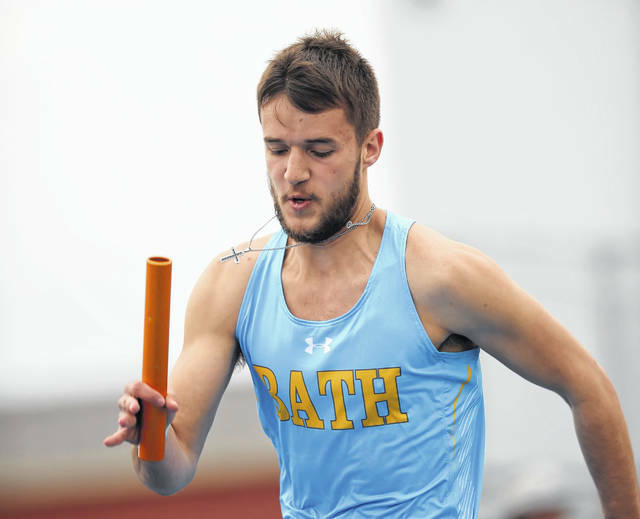 Bath’s Josh Carman competes in the 400 relay during Friday night’s Ehresman Memorial Track and Field Invitational. Van Wert’s Jill Gemmer competes in the discus during Friday’s Ehresman Memorial Track and Field Invitational. BATH TOWNSHIP — The Van Wert track-and-field team has been known over the years to be difficult to beat on the track. 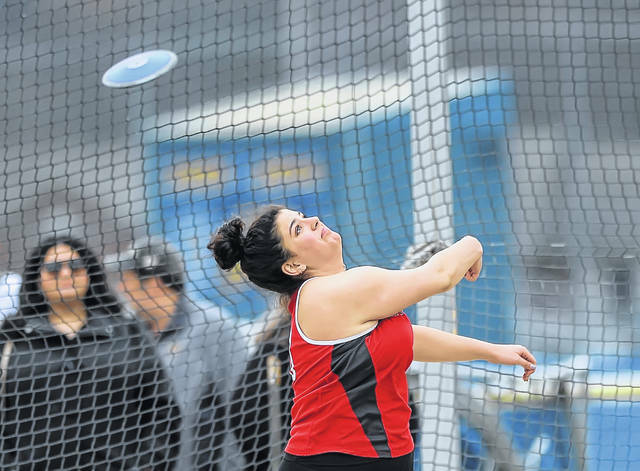 However, in the last several years, Van Wert’s throwers have been making a name for themselves. At Friday’s Ehresman Invitational at Bath, Van Wert’s throwers scored some lofty points to lead the way. Leading the charge for Van Wert Friday was senior Austin Clay, who won both the shot put and discus. In the shot put, Clay broke the meet record with a mark of 55 feet, 8 ½ inches. Clay, a two-time state qualifier, has signed to compete at Central Michigan University next school year. In the discus, Clay won with a toss of 152-6. Clay has the school record in the shot put (56-11). This winter, during the indoor season, Clay set a personal best put of 59-4. Austin Clay’s sister, Kirsten, finished runner-up Friday to teammate Jill Gemmer, in both the shot put and discus. The Clay’s father, Brian Clay, was a state runner-up in the shot put at Van Wert in 1986. Gemmer, a transfer from Delphos St. John’s, placed eighth last season at the Division III state meet in the shot put. Van Wert throws coach Hannah Philpot said all of her throwers are totally committed. In the final team standings Friday, the Van Wert boys won with 113 points and Elida finished second with 89 points. Shawnee finished third (71), while St. Marys (56) rounded out the top four teams in the 10-team field. On the girls’ side, Kalida edged out Elida 85.5-80. Shawnee (73.83) and Van Wert (71.33) rounded out the top four squads. Kalida’s Josh Verhoff and Shawnee’s Christian Ford – two of the best sprinters in their respective divisions – went head to head Friday night. Verhoff edged out Ford in both the 100- and 200-meters. “I just came out here and tried to do my best,” Verhoff said. “There’s a lot of excitement, a lot of great people out here. 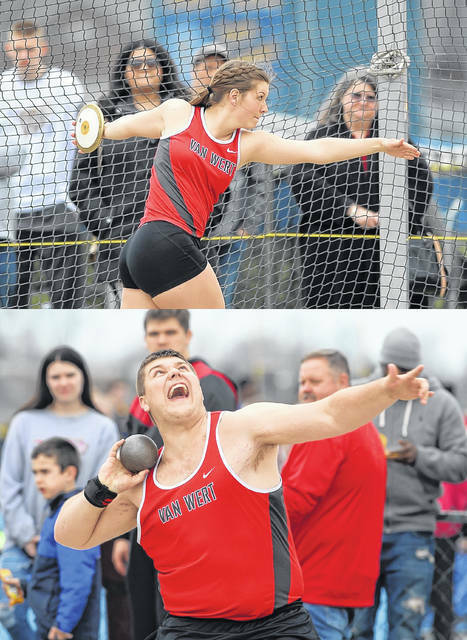 https://www.limaohio.com/wp-content/uploads/sites/54/2019/04/web1_vwsiblings-2.jpgVan Wert’s Kristen Clay, top, and Austin Clay compete in the discus and shot put respectively during Friday night’s Ehresman Memorial Track and Field Invitational. This entry was tagged vanwert. Bookmark the permalink.